This brand is by far the best when it comes to baked beans. Full of flavor and great with a buffet style breakfast or on toast for an easy lunch or dinner. We always have them on hand in the cupboard! SPC’s baked beans are simply just good baked beans. I must admit that often some of my favourite meals are some of the most basic. I love hot baked beans on toast and when the beans are this good it gives me a big smile! 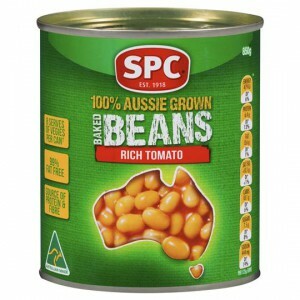 I don’t like other brands of baked beans and only buy SPC as we all like them. Not crunchy like some other brands. I agree with another reviewer that they are not as good as they were prior to the recipe change. They can be inconsistent with the amount of sauce too. Sometimes lots of beans and less sauce, other times they are swimming in sauce! I don’t mind that though. Bonus is they are an Australian product. Overall a tasty, cheap snack or meal. I used to really like the tomato sauce flavour but recently it appears the flavour/recipe has changed and they no longer taste the same. Its disappointing because this was my quick n easy share meal with my babies. My daughter and I often share a tin of Spc’s extra tomato sauce baked beans for lunch. The extra sauce is delicious and makes mopping up with bread even more fun. These are really really nice and I usually try to keep a few tins in the cupboard for those nights where you just can’t be bothered. But they are quite expensive next to other brands that are almost as good. How would you rate Spc Baked Beans Extra Tomato Sauce?